We're just about ready to leave for Sonoma, so I probably won't be posting until Monday or Tuesday. I will hopefully have some beautiful photos of our menu to show. Below I've reposted the only video I have of an actual Passport appetizer. We've served this one several times and it's a great bite to pair with red wine. Keep it in mind the next time you are entertaining. This version uses cream cheese, but we've done it using Teleme, and Crescenza (you'll have to Google them unless you are a real cheese head). Anyway, keep an eye on the blog while I'm gone. Enjoy! 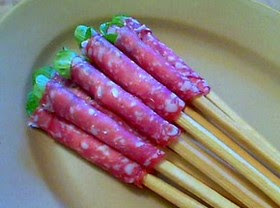 The following video was originally included in a post entitled: "Calabrese Lollipops – Antipasto on a stick!" If i have read this right ur video is that of a passover appetizer? thats just Youtube, try again it works, I just checked. Thanks! Nice.. gotta try this with some ham/provolone/ baby swiss/ salami.. hell forget it.. I'ma make a sandwich now! Have a great time.. AND SEND PICS PLEASE! Love it! Great idea...I plan on using a version of this for my sons up comming birthday party...very cool! Apperently YouTube doesn't like me.. still no video for me..
BTW the way, the post name Calabrese Lollipops – Antipasto on a stick! reminds me a lot of Jeff Dunham, and José Jalepeno.. great fun.. They look like a Chef John version of "goat peckers" (commonly seen at church potlucks, etc.). Could I use Quark in exchange for the cheese? It is a little bit more tart.